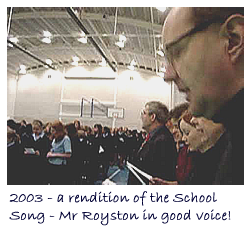 Patrick Royston taught Latin, Classics and French at the Girls' High for a very long time - 33 years! He had a great love of the school and was always willing to give his time to help his pupils. He was a gentle soul, knowledgable, interested in a wide range of subjects an having an amazing memory for names, dates and past occurances. He loved to tell anecdotal tales of his time at the school and I spent many an hour listening to his tales. I had no idea he was suffering with depression and had done for years - dating back to his time as an undergraduate at Oxford University. Sometimes stressed and frazzled (most teachers are!) but mainly calm and supportive, he seemed a happy soul. It was therefore a great shock to me when he took his own life, by hanging himself in December 2012. He is greatly missed. Click on the photo to suffer the staff singing heartily! Patrick always sang with gusto - as did many of us! Click here to see tributes by his pupils.